She's almost glowing now, with her new exterior renovations and tile work. Here are a few quick shots of Independence, as seen on Friday (March 28). 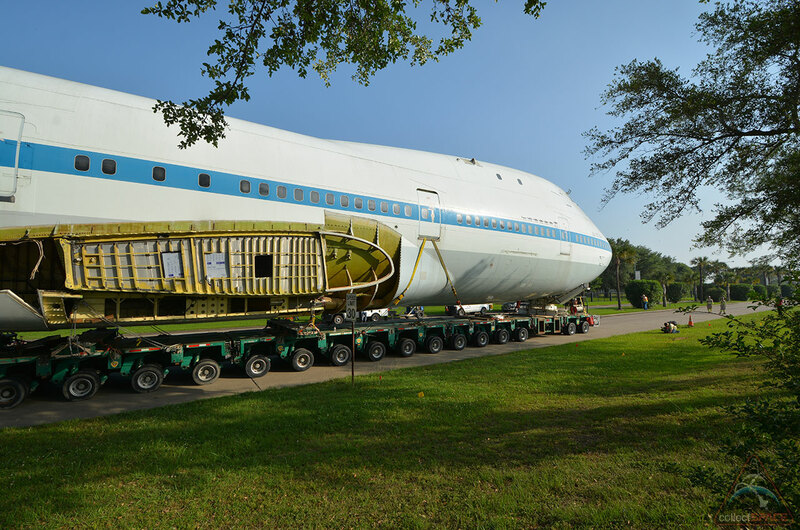 A historic NASA jumbo jet has been cleared for its final takeoff — not into the air, but on a road trip through the streets of Houston to the site of its future exhibit. The space agency's original Shuttle Carrier Aircraft (SCA), a modified Boeing 747 jetliner that for more than 30 years ferried NASA's now-retired orbiters across the country, will make the journey from Houston's Ellington Field to Space Center Houston, the official visitor center for the Johnson Space Center, over the course of two nights at the end of April. "The BIG Move!" 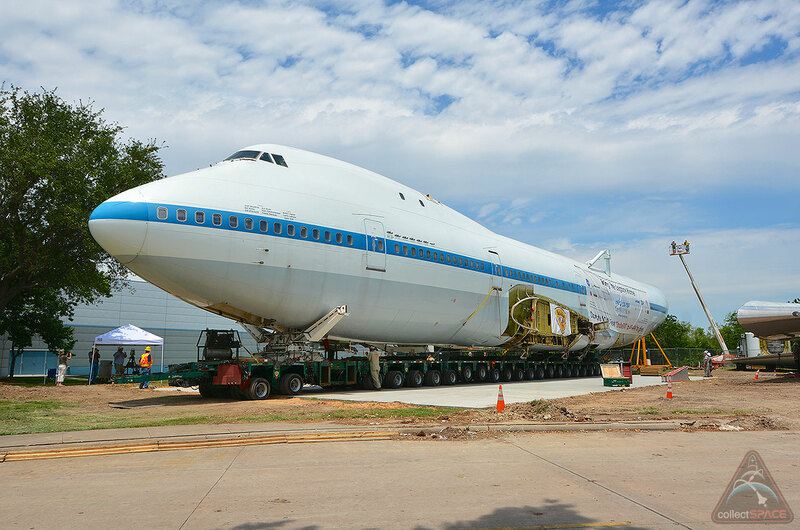 Space Center Houston officials wrote on Facebook. 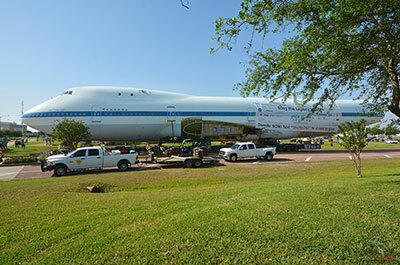 "The Shuttle Carrier Aircraft will start its move from Ellington Field to Space Center Houston on April 28." Space Center Houston has debuted its landing page, spacecenter.org/bigmove, for the "Big Move." 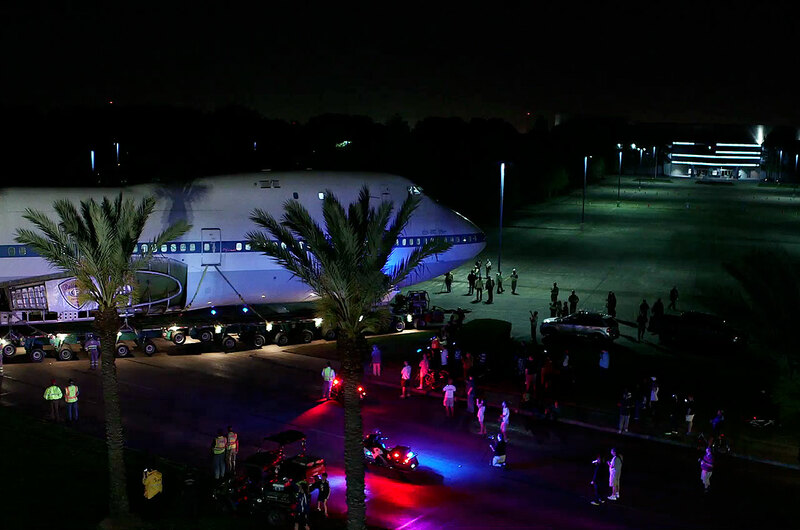 Our 747 Shuttle Carrier Aircraft is on its final approach with the big move slated the nights of April 28 and 29, arriving early on April 30 at the nonprofit Space Center Houston. We need your help to bring it in for a landing! Pledge a donation today by texting "Shuttle747" to 41444. A portion of Highway 3 (Old Galveston Road) will close in various stages 9 p.m. to 6 a.m. April 28. 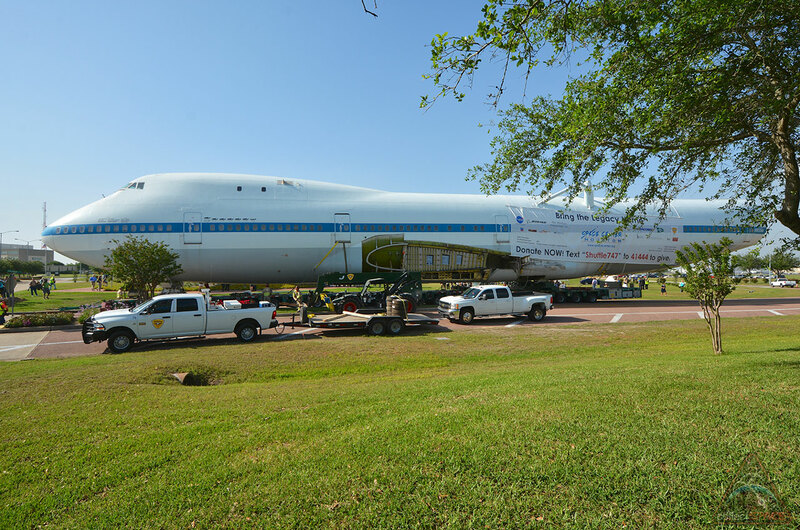 Then on April 29, a portion of NASA Parkway will close 9 p.m. to 6 a.m. Both roads will close as the 1,000-foot convoy approaches and will re-open after it passes. Robert, I'm looking forward to your photos of the move, can't wait! The website for the move is nicely done as well. I was wondering, some of the photos on the site show the shuttle and SCA in flight and it would be great to provide photos from the public for part of the exhibit. 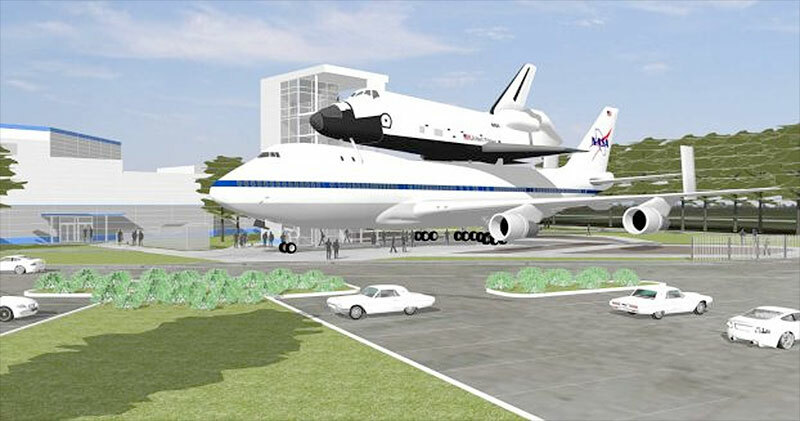 Do you know if NASA or JSC plan on soliciting public photos? It would make a great addition. 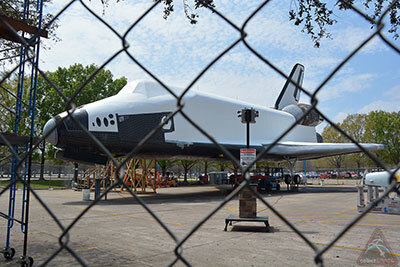 Space Center Houston has not said anything yet about requesting public photos. 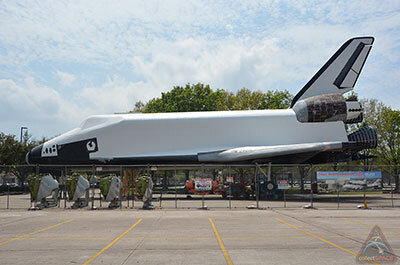 The exhibits inside NASA 905 will cover the history of the SCA in part, while mostly focusing on the larger legacy of the space shuttle program as a whole. 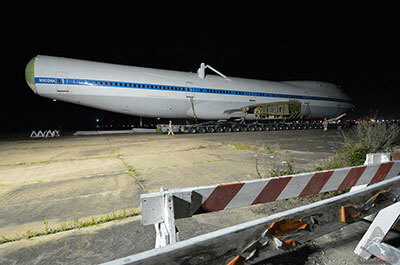 With the "big move" of the Shuttle Carrier Aircraft (SCA) "NASA 905" from Ellington Field to Space Center Houston set to begin Monday night (April 28), the partially-disassembled, modified Boeing 747 was repositioned from a tarmac to a taxiway late Thursday evening (April 24). Traveling atop four self-propelled trailers and three tractor-trailers, the SCA convoy stretched more than a 1,000 feet when in motion. When it departs the airport on Monday, the jumbo jet will move nearly eight miles over the course of two nights, traveling nearly six miles on April 28 and two miles on April 29. 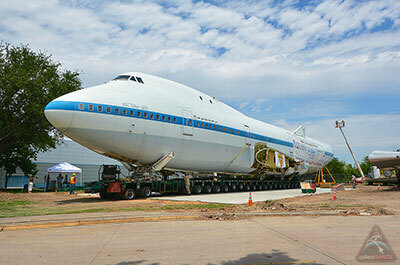 It arrives early April 30 at Space Center Houston, where it will go on public display in 2015. Interesting sidebar tidbit, I shared this info with Col. Bob Mosley, who was a test pilot at Edwards and the brother of Zack Mosley who did the Smilin Jack comic strips. He flew the NB-52 for some X-15 drops, including one of Bob White's records. And Fitz Fulton — who flew the first flights of 905 and through the ALT program. Both were very interested in this, Fitz for obvious reasons. Bob, for a reason most people do not know. 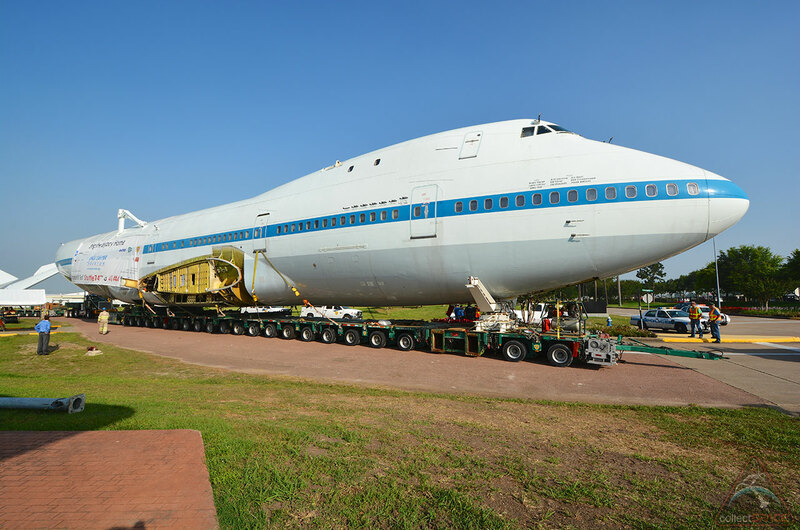 When he retired from the USAF he went to work for Rockwell, and brokered the deal for 905, and was involved in the transition from Boeing to Edwards, and the assembly. Is there any way to find out how many flights NASA 905 has flown (including when it was at American Airlines?) 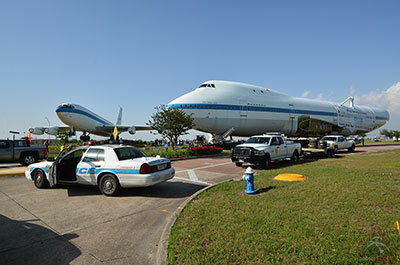 Also, the same for NASA 911 when it was part of KLM Airlines? Just curious for the actual numbers of flights for each plane. 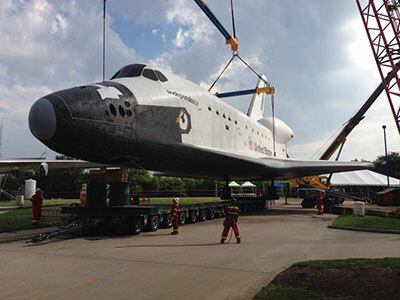 905 made 2,953 flights prior to coming to NASA and made 821 flights with NASA for a total of 3,774. I've never found a reference for 911 prior to NASA service. 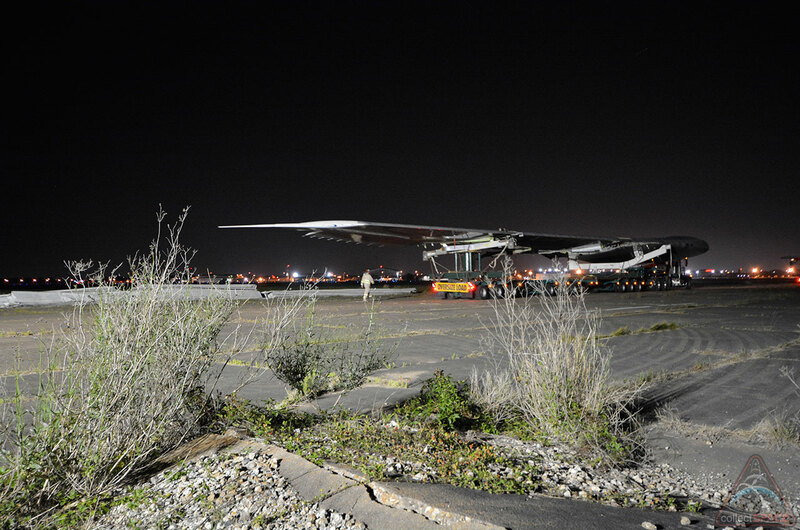 Wow, that is not many landings. Typically they fly 30,000 to 40,000 landings. So cautions bright orange signs now positioned alongside roads leading to and from NASA's Johnson Space Center in Houston. 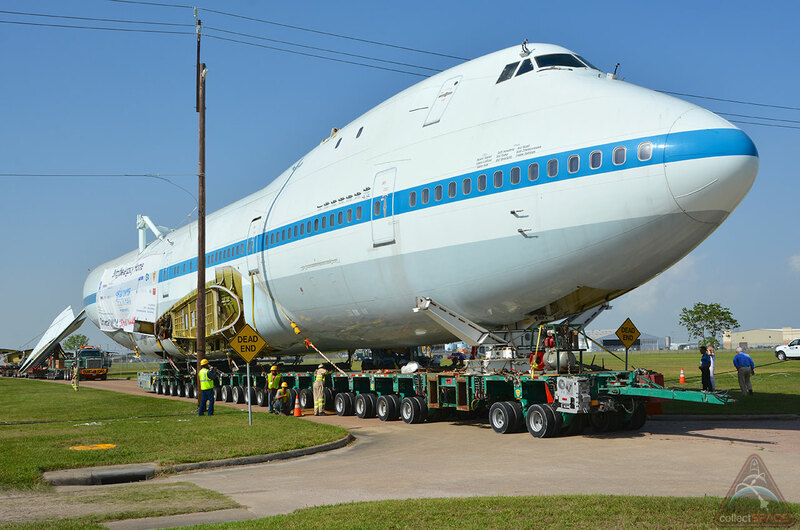 The traffic advisories were placed in advance of the space agency's Shuttle Carrier Aircraft (SCA) being moved, set to begin Monday night (April 28). "Oversize" though, might be an understatement. 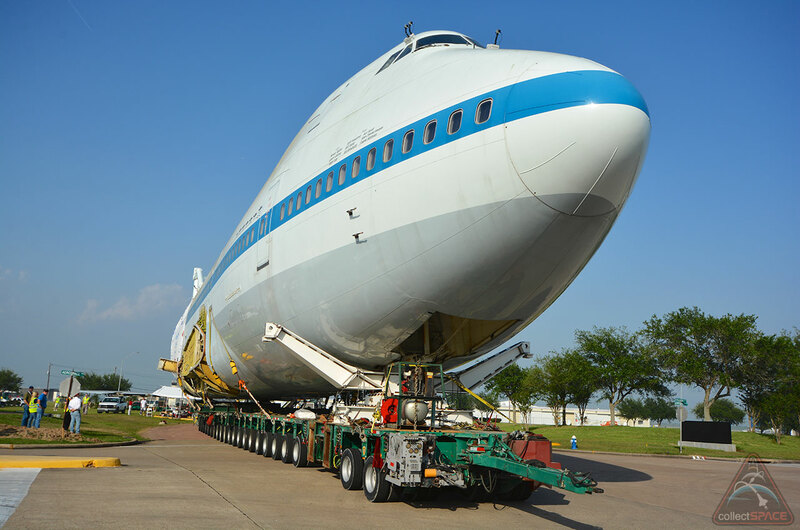 The Boeing 747 jumbo jet, which for three decades ferried NASA's shuttles across the country, will be transported in its current dismantled state by a convoy stretching 1,000 feet long (305 meters), including four self-propelled trailers and three tractor-trailers. The fuselage, the largest section to be moved intact, roughly spans the length of two NBA basketball courts. I noticed in one of the picture, I saw that that the tailcone will be attached on the Independence shuttle; will that really happen? 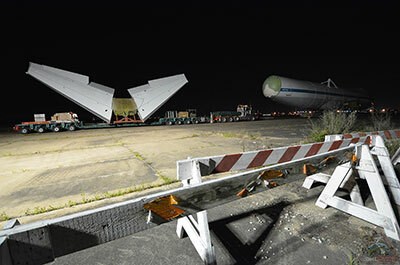 The attraction's design plans call for a tail cone to be installed on Independence. The first details surrounding that addition will be shared soon. I work for a global shipping and logistics company. I opened up an employee email last week and learned it is our company that is moving the SCA on this trip. It is typical of the work we do. I was pleased to read this news. 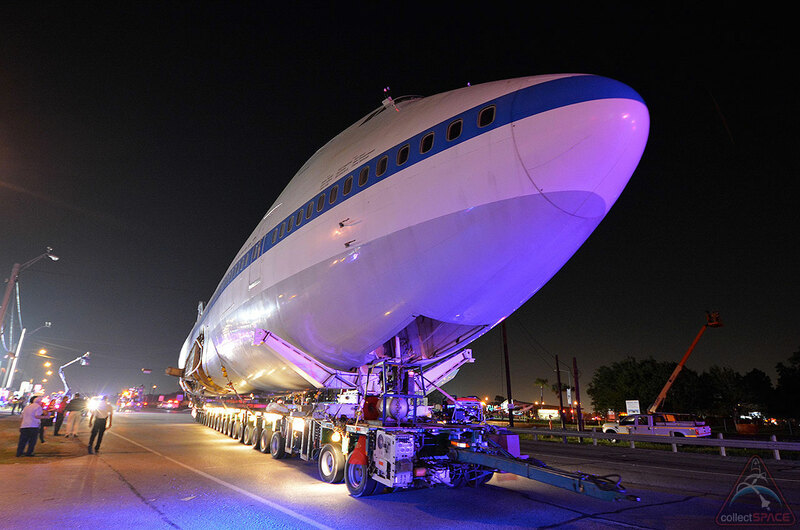 NASA's original Shuttle Carrier Aircraft, NASA 905, began its 8-mile, two-night move to Space Center Houston on Monday (April 28) with its 1,000-foot-long convoy staging the partially-dismantled aircraft at the exit to Ellington Field. 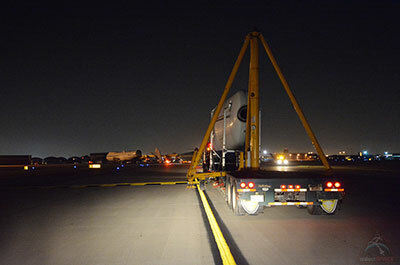 Later Monday evening beginning around 9:30 p.m. CDT, the seven self-propelled and tractor trailers will depart the airport's property and slowly proceed overnight down a six mile stretch of Texas Highway 3. 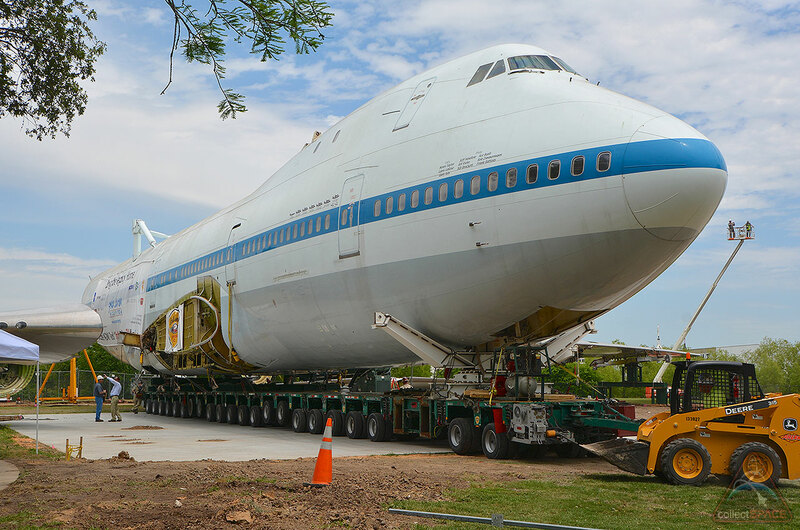 NASA's original shuttle-carrying jumbo jet is on the move. Two years after completing its final orbiter ferry flights, the space agency's Shuttle Carrier Aircraft (SCA), a modified Boeing 747, departed an air field in Houston to be placed on public display. The partially-dismantled, white and blue jetliner completed the first leg of its 8-mile (13-kilometer), two-night road trip to Space Center Houston overnight on Monday (April 28). "Even in a state as big as Texas, a move of this size is unprecedented," Houston Mayor Annise Parker said in a statement. 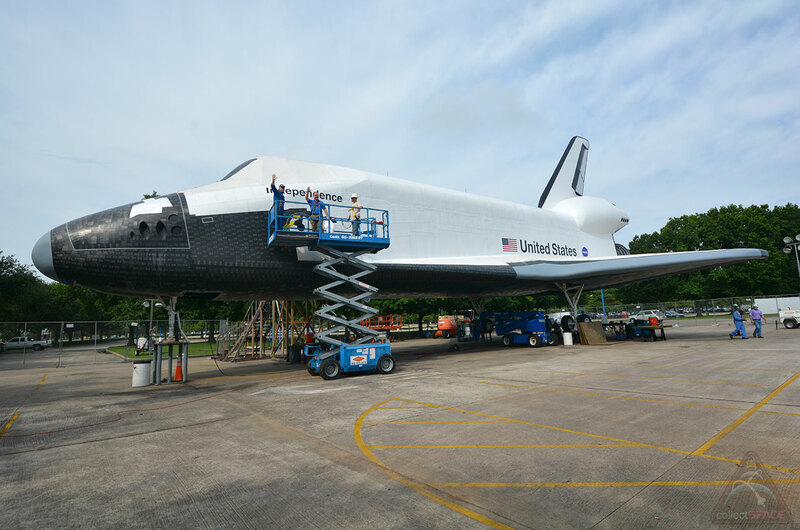 "This massive exhibit will celebrate American ingenuity and create an international icon highlighting Houston's leadership role as Space City, USA." 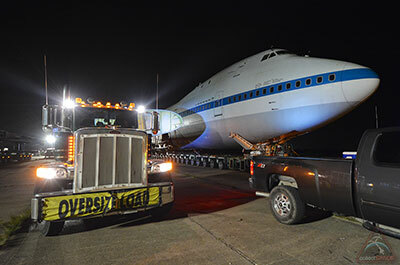 See here for more photos of the first leg of NASA 905's "big move." Houston, the SCA has landed. 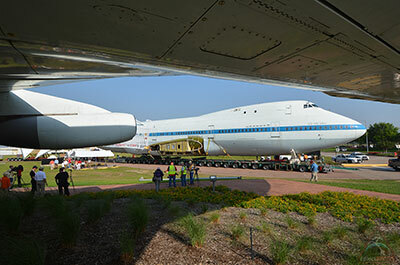 NASA's original Shuttle Carrier Aircraft (SCA), a modified Boeing 747 jumbo jetliner that for three decades flew the space agency's orbiters coast to coast, completed a two-night road trip to Space Center Houston early Wednesday morning (April 30). "Home sweet home," the center announced on Twitter. The 8-mile (13-kilometer) move, which began at Houston's Ellington Field on Monday, was in preparation for the jet to become the centerpiece of a new $12 million, eight-story-tall attraction, which will display the SCA topped with the space shuttle "Independence," a high-fidelity, walk-through orbiter replica. 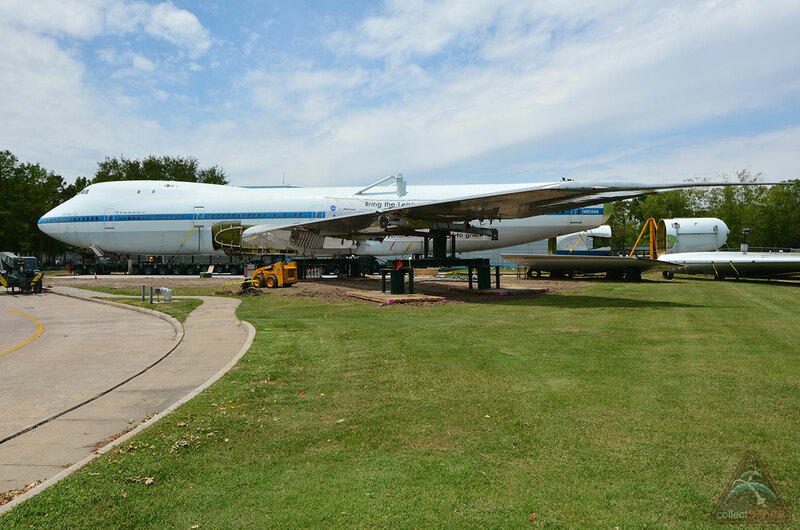 The outdoor exhibit is scheduled to open in March 2015. 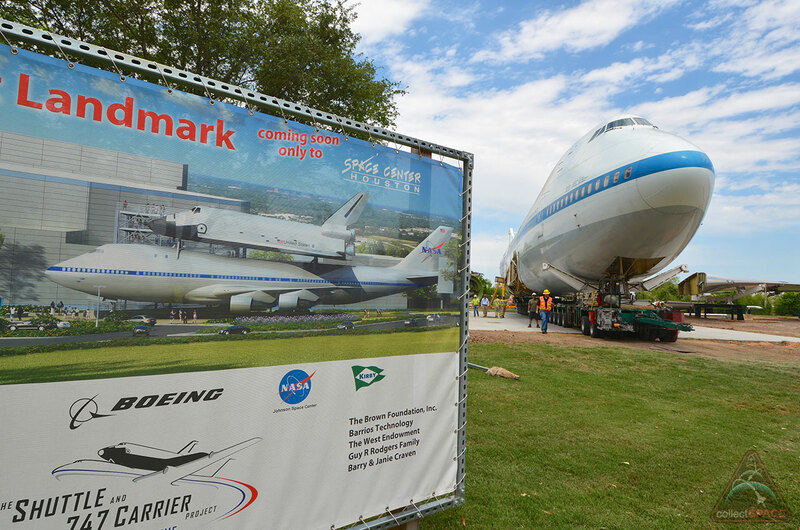 Just two days after arriving at Space Center Houston, NASA's original Shuttle Carrier Aircraft, NASA 905, was rolled into place for its future public display on a concrete pad outside the Johnson Space Center visitor center. 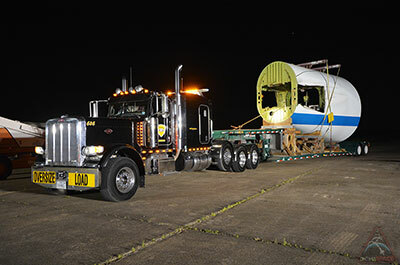 Boeing's Aircraft on Ground (AOG) team will now spend the next five to seven weeks reassembling the historic plane, reattaching its wings, horizontal and vertical stabilizers and tail cone sections in preparation for the space shuttle Independence mockup being mounted atop the aircraft later this summer. A replica of a NASA space shuttle on display in Houston was defaced Wednesday (Nov. 27), when vandals sprayed racial and political graffiti on the side of the full-size mockup. 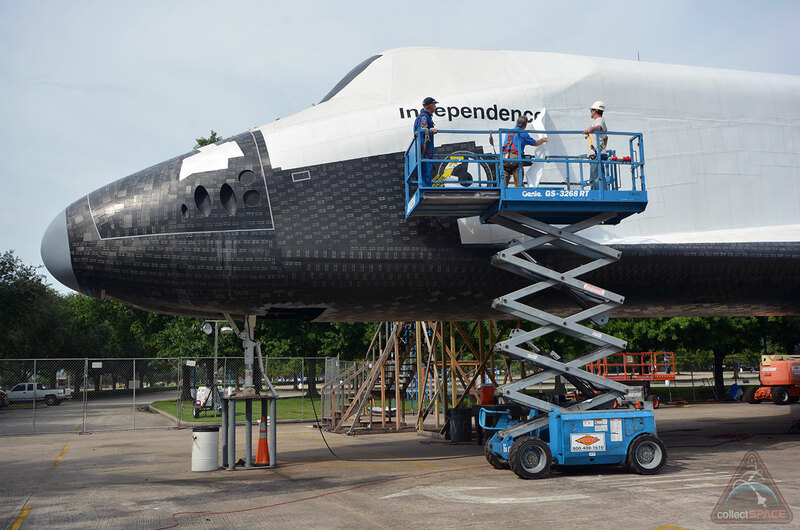 Jesse Ray Calloway, 19, on Tuesday (June 11) pleaded guilty to the Nov. 27, 2013 vandalism of the space shuttle Independence mockup. Calloway surrendered to authorities in January after a tip from Crime Stoppers. 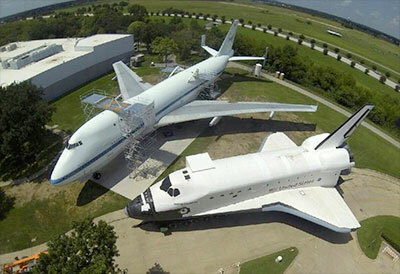 Calloway was sentenced to 30 days in jail, two years probation, a total of $3,550 in fines and restitution, 40 hours mandatory community service and he has to write three letters of apology to the citizens of Harris County, to NASA's Johnson Space Center and to the President of the United States. 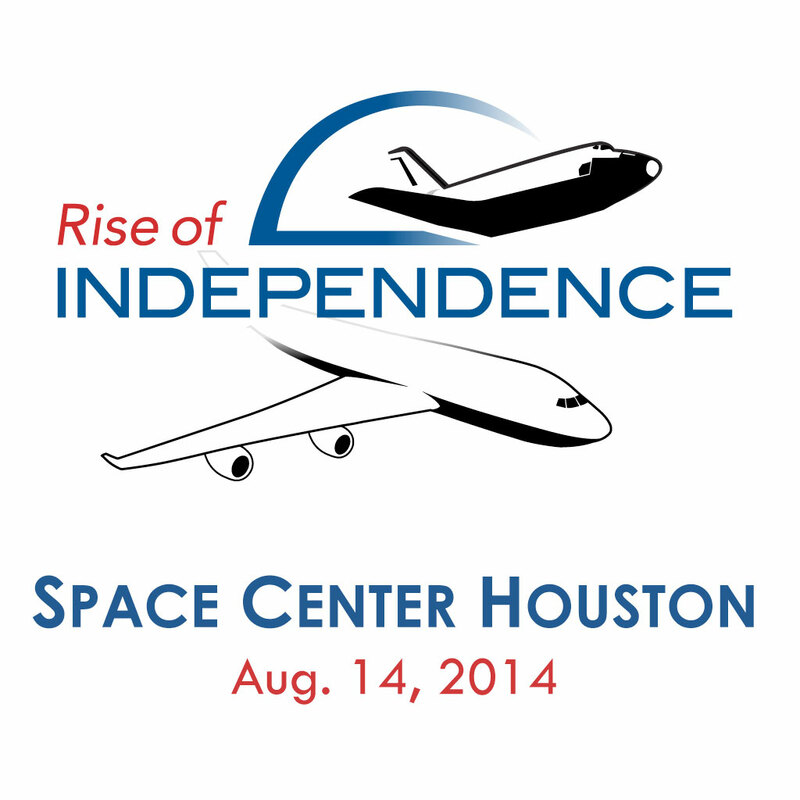 On the Space Center Houston Facebook page it indicates that Independence will be placed on the 747 on August 14th! 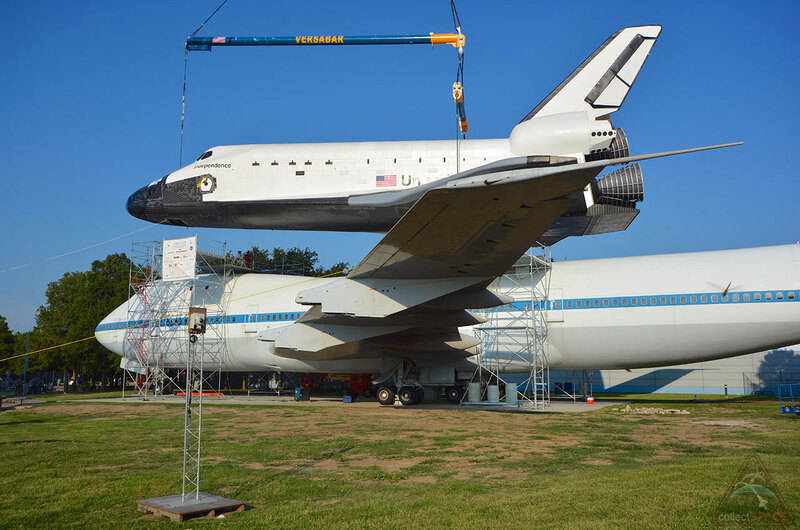 Join us for an early morning celebration as a large crane raises Independence, the crowning addition to the 747 exhibition, and places it on top of the mighty shuttle carrier aircraft. The public is invited to join us for a free presentation starting at 7:30 a.m.
Time and dates are subject to change and weather conditions. 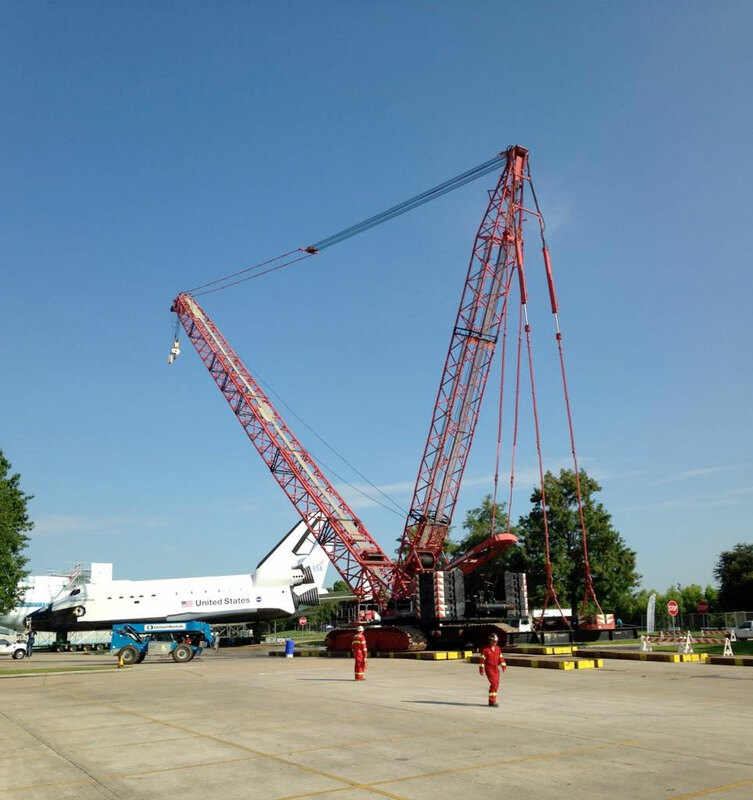 The public is invited to see a giant crane lift the space shuttle replica Independence to its permanent home atop Space Center Houston's historic shuttle carrier aircraft on Thursday, Aug. 14. The free event Rise of Independence will mark another chapter in the ongoing story of Space Center Houston's future world-class exhibit. At 8 a.m., a team of skilled engineers and planners in partnership with the center will lift the massive shuttle by crane (weather permitting). The ceremony preceding the lift begins at 7:15 a.m. There is limited viewing available on a first-come, first-served basis. The event will be postponed to another date in the event of rain or high winds, but updates will posted on both the center website and Facebook page. The nonprofit Space Center Houston still needs to raise $2.2 million as part of its $12 million capital campaign called Bring the Legacy Home. It invites people to give by texting "Shuttle747" to 41444 or visiting spacecenter.org/giving. And the name still looks temporary. 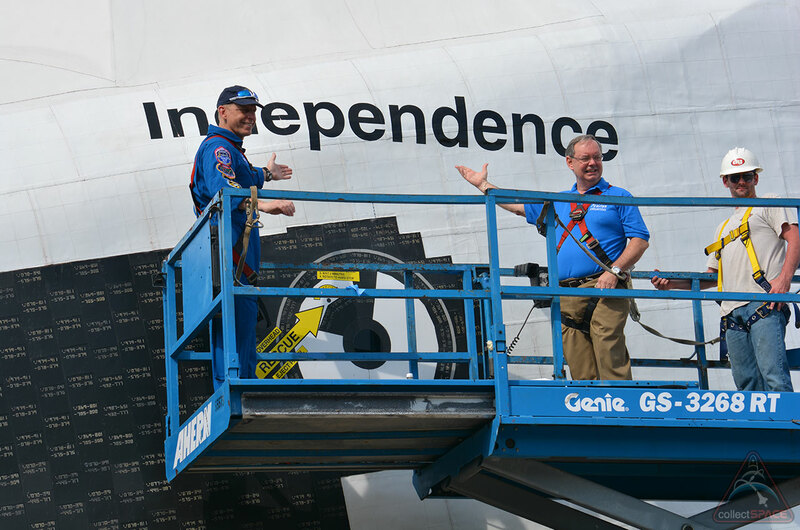 This morning (July 25), Space Center Houston president and CEO Richard Allen was joined by shuttle astronaut Clay Anderson in revealing the permanent decal identifying the orbiter as "Independence." 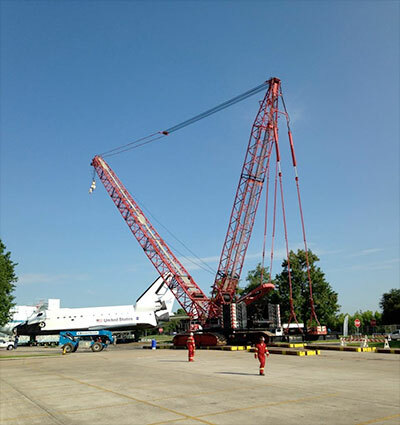 The 243-foot-tall (74 meter) crane has also arrived at the center for the lift. 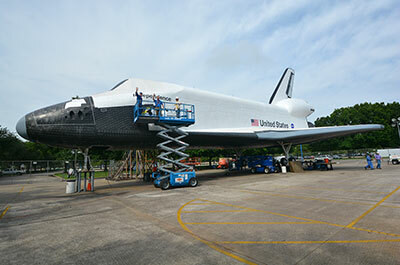 From the aerial view one can't help but notice that the shuttle's wings look a little... naked. Safe to assume that they plan on adding graphics sometime in the future? Robert did you get up in that crane to take that photo? The graphics are being added today. The surfaces were cleaned last night and this morning in preparation for the application. From the aerial view one can't help but notice that the shuttle's wings look a little... naked. 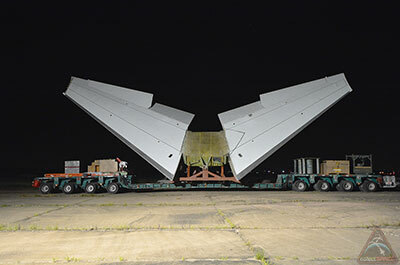 To me the SCA wings (sans engines) look naked. Engines will being added before the exhibit opens, as well. 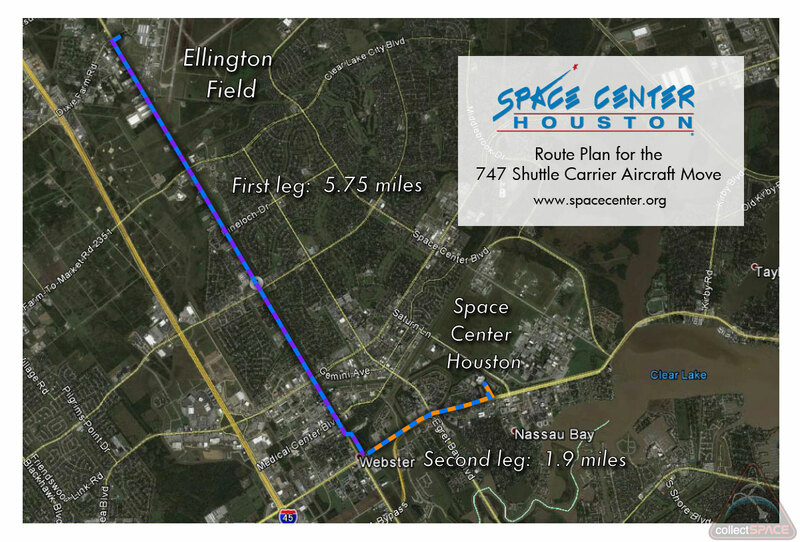 Space Center Houston has sourced two engines and are in the process of sourcing two more. Safe to assume that they plan on adding graphics sometime in the future? 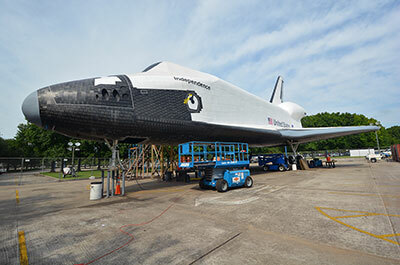 That's an interesting question: Will the wings be painted with the NASA meatball (as the shuttles retired); the NASA worm logo and name underneath the logo (introduced by Challenger); as like Enterprise with USA on the starboard wing; or as like Columbia with U S A (the letters spread out) on the starboard wing? A few random things I've been curious about... Hurricane stability, I see that the 747 is bolted to it's pad. 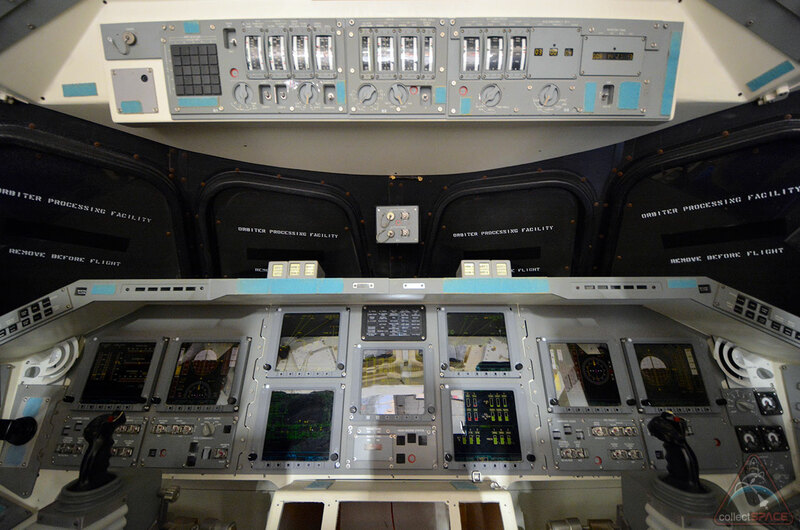 Will the interfaces to Independence be enough to ensure the capability to survive a major storm, or will there be any exterior supports required? Also, I heard the tail cone was planned. 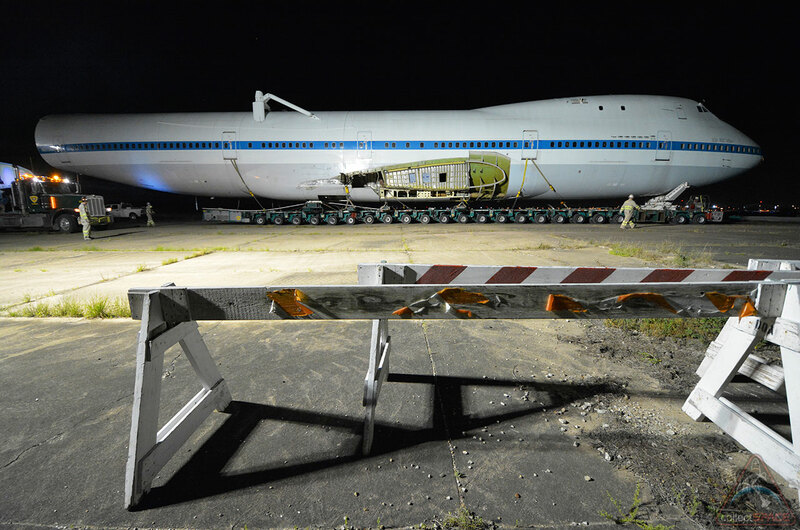 Anyone know how many tail cones there were? One is on Enterprise in NYC, correct? I was wondering if there was another 'real' cone, or if a replica needed to be built. There are attach points on the shuttle to run support cables in advance of a storm. As for tailcones, two were originally built, only one (attached to Enterprise) still survives. 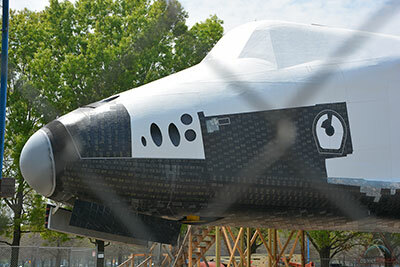 A replica will need to constructed for the exhibit, but its addition is not planned until after the opening. 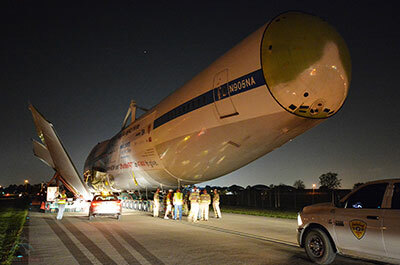 It was not quite a blast off, but a full-size, replica space shuttle rose into the morning sky over Houston on Thursday (Aug. 14), as it was mounted on top of a historic NASA jumbo jet. 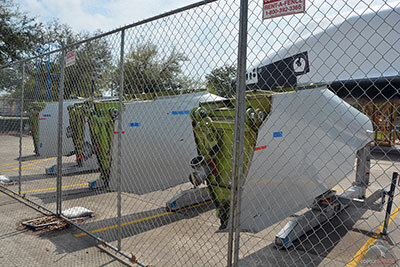 As for tailcones, two were originally built, only one (attached to Enterprise) still survives. 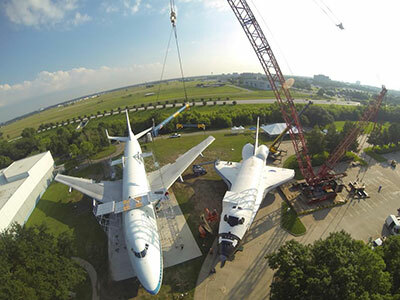 I don't mean to hijack the thread but what were the circumstances surrounding the second tailcone's demise? Can anyone provide a link or reference?